Hello there! 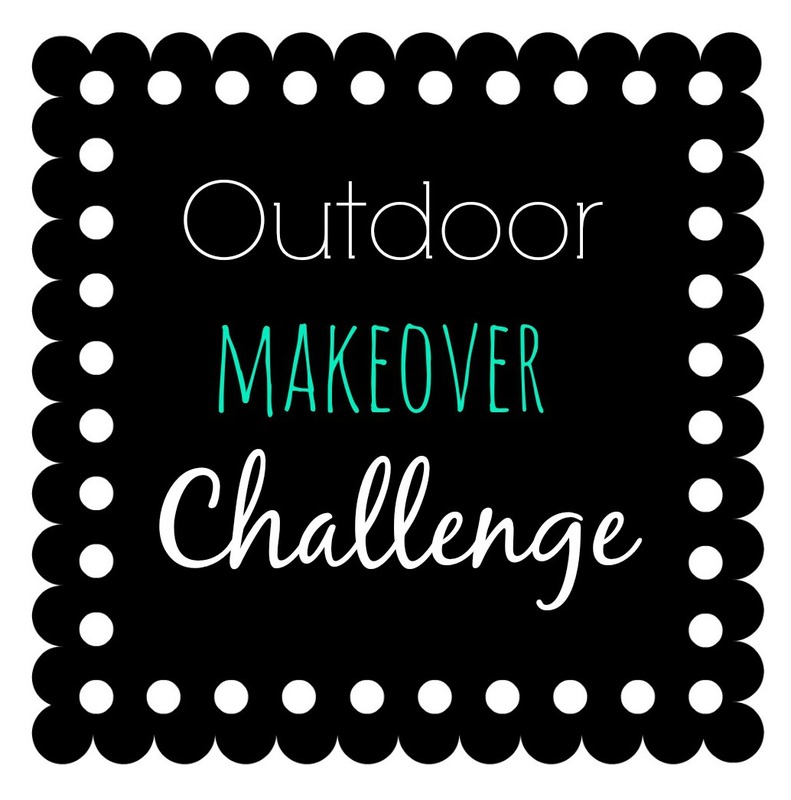 Welcome to week three of the Outdoor Makeover Challenge! 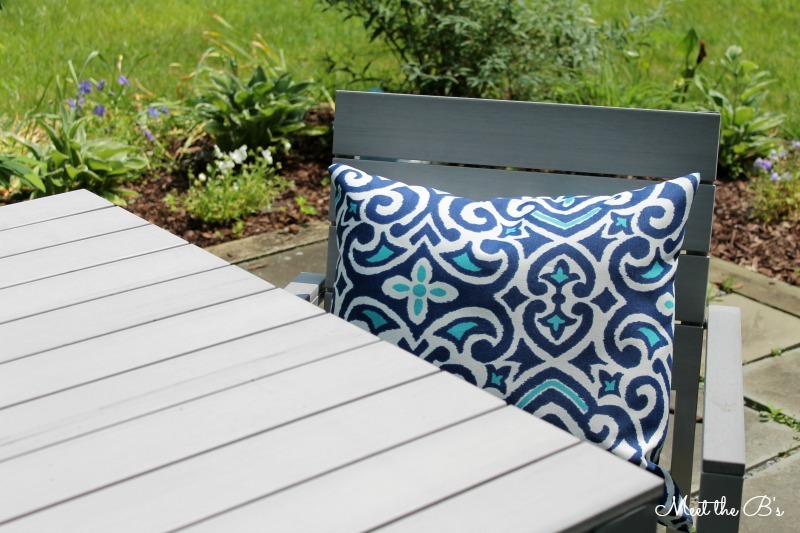 I am participating in a budget friendly patio update with my friend Kristi at making it in the mountains. 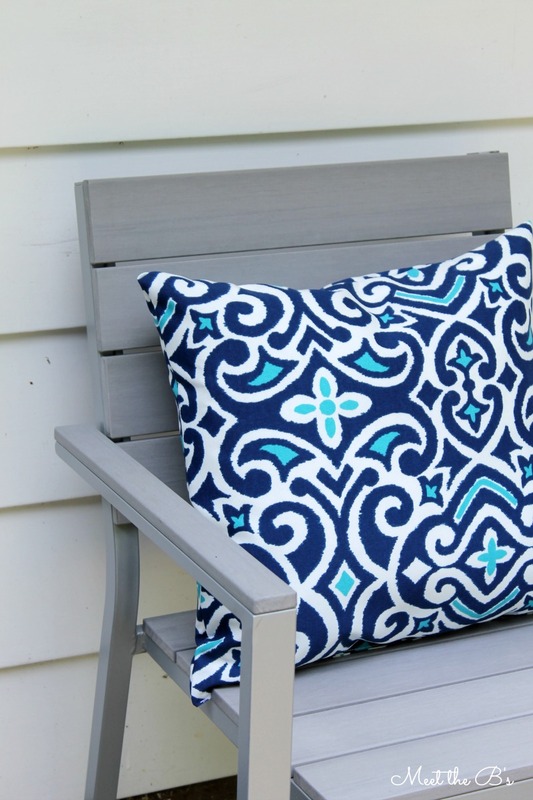 We're bringing you some great outdoor projects and inspiration just in time for summer! My husband and I have been hard at work on several projects for our patio. I can't wait for you to see the final reveal next week! Outdoor fabric is usually pretty expensive since its heavy duty high quality material meant to withstand the weather. With the sale going on, my quick math calculations told me I could make four pillows for the cost of just one pre-made pillow from the other stores I had been searching. Way cheaper and in my color scheme? I was sold. 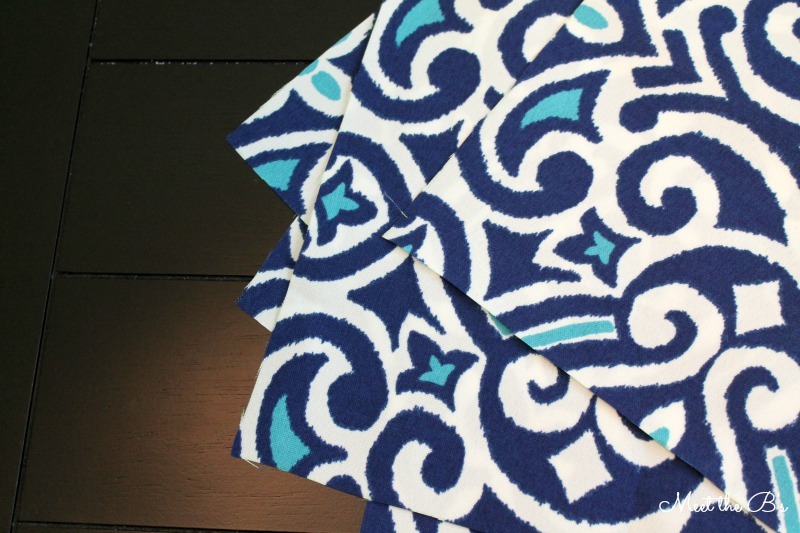 I bought two yards of Robert Allen's Baja Damask in "marine." So then, I was on the hunt for pillow forms. 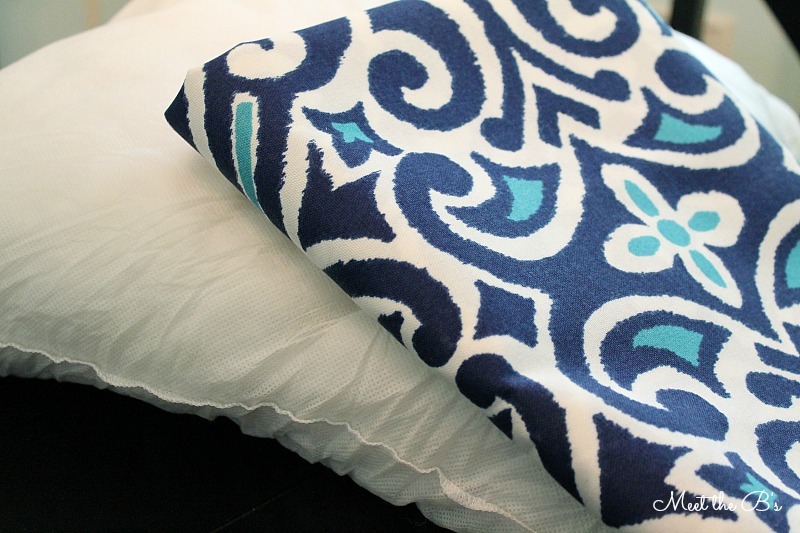 I found a few relatively cheap sources online, but then I found 20x20 pillow forms at Ikea for only $2.99! Can't beat that! 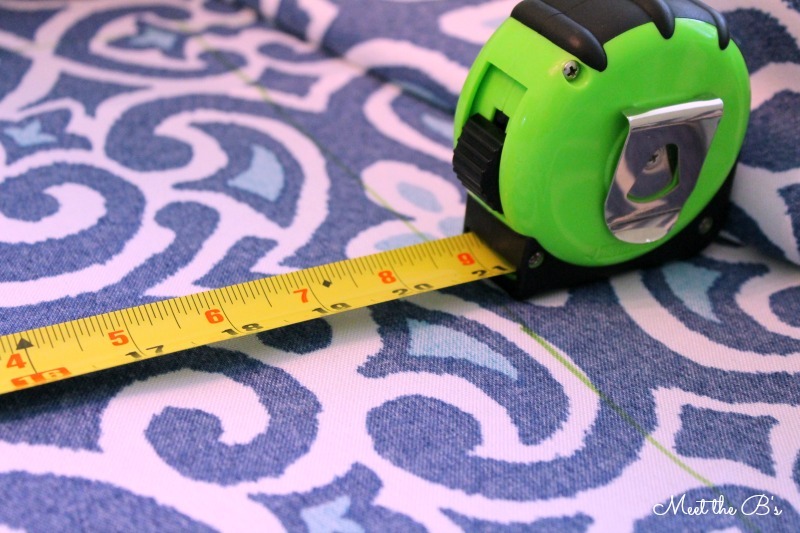 I started by measuring out my fabric. I measured 21" squares for my 20" pillows to give myself a little overhang to work with. I intended to make four pillows, but I didn't plan my cuts very well and was only able to cut out enough squares for three pillows. As soon as I see another sale, I'll be making number four! I pinned and sewed the edge with the text on it first so that it wouldn't accidentally become misaligned somehow. I didn't want the text to be showing on the outside of the pillow! 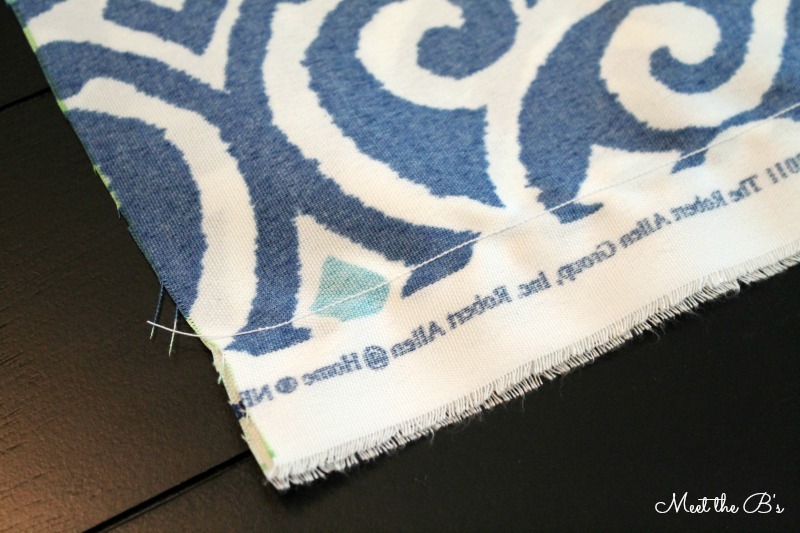 Be sure to sew with the unprinted side of the fabric facing out so that your seams won't show. Then I pinned and sewed two more sides, leaving the fourth side free. I turned my pillow case inside out, straightened out the corners, inserted the pillow form, and then pinned and sewed the last side. This by far was the trickiest side to sew! I wanted to get close to the edge so that the seam wouldn't be an eye sore, but the sewing machine didn't like that very much. We got in a few fights, and I've got some pretty crooked seams, but hey, I made my first pillow!!! Woohoo!!! This week's cost breakdown: Three pillow forms: $9Two yards of fabric: $20Total cost: $29Don't forget to stop by next Thursday for the final reveal! 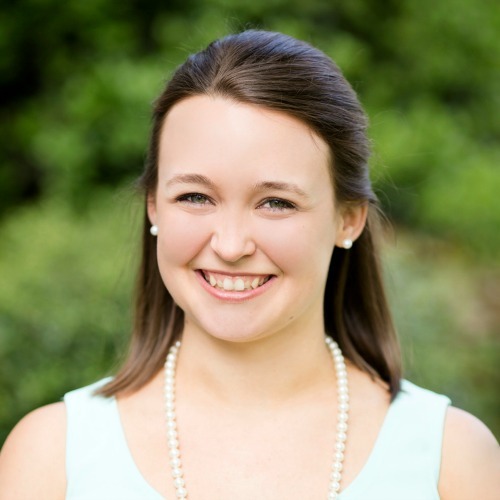 And be sure to check out what Kristi is working on this week too!! She's got some great projects up her sleeves!! hahaha thank you :) he does look chatty, doesn't he? Great job! 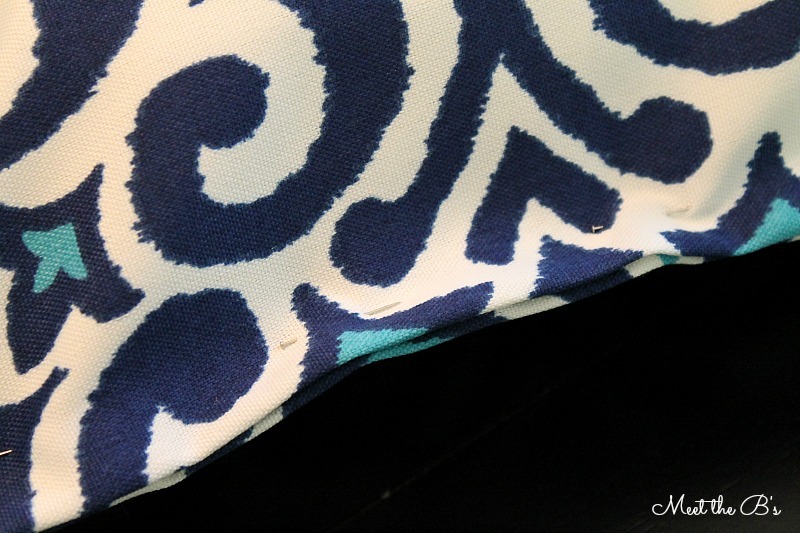 Love that fabric, thanks for linking up to The Creative Collection Link Party! Thank you Lisa! 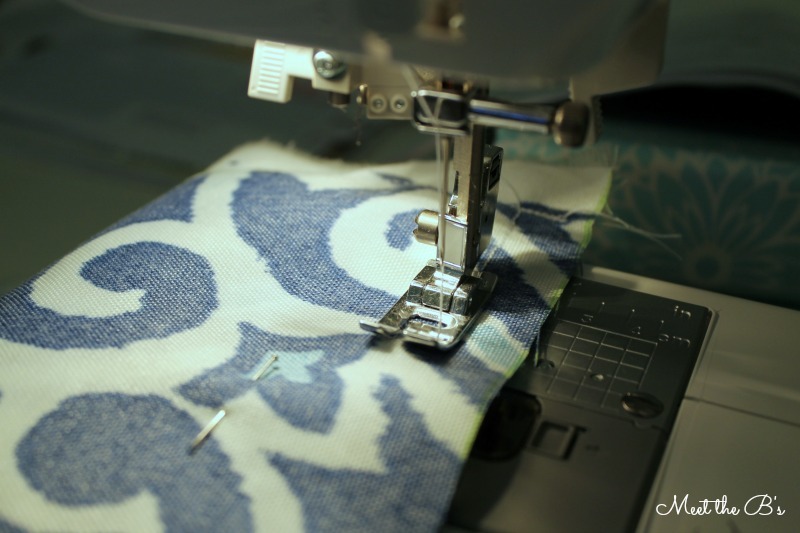 I never would have thought I could successfully sew anything!!! That's one crafty thing I've been scared to take on! Well, I was reading about your patio makeover but was totally detracted by your AWESOME pillows...and ended up here, lol! They are beautiful!!! And thanks for that ikea tip!! That is great to know! Aww, thank you Kristi! Isn't that fabric amazing?! And I always look at Ikea for project materials because they are so affordable!